The rooms of this family residence in Texas by local studio Matt Fajkus Architecture are punctured with windows of different sizes, to frame views of an old tree at the centre of the plot. 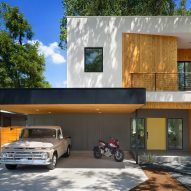 Encompassing 2,764 square feet (257 square metres), the Tree House is situated on an urban lot in Austin. The design of the two-storey dwelling was largely influenced by a mature oak tree on the property. "Balanced shade, dappled sunlight and tree canopy views are the basis of the Tree House design," said Matt Fajkus Architecture. 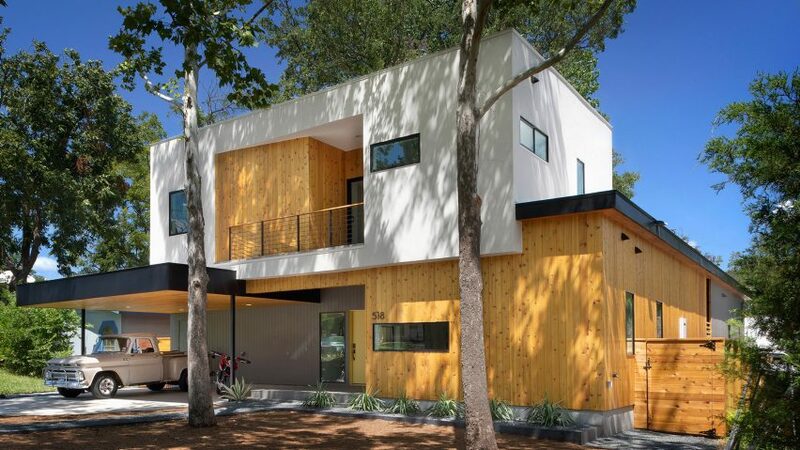 "The entry is on centre with the lot's primary live oak tree, and each interior space has a unique relationship to this central element." The home consists of two elongated wings connected to form a U-shaped plan, which wraps around a rear courtyard that steps down to a grassy yard. The lower portion of the home is clad in boards of western red cedar, while the upper level is largely covered in stucco. For the front elevation, the team carved away the centre of the upper volume to create a recessed balcony. The architects also added a canopy made of metal and wood, which pushes out from the facade and forms a carport. At the rear, the upper portion of the central volume folds back, enabling the oak tree's canopy to grow and extend outward. Windows of varying sizes frame views of the tree and bring in natural light. "The windows act as playful apertures which activate the courtyard space at night, showcasing the preserved live oak," the team said. 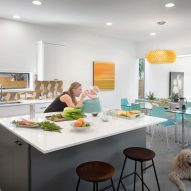 In plan, the home is divided into public and private zones, with the courtyard serving as the connective element. The east wing contains the master suite, while the west wing houses the living, dining and cooking areas. The central volume contains an entry foyer at ground level, and two bedrooms up above. "The layout is arranged to optimise function and experience, where each daily behaviour is considered in connection with the next, resulting in a holistic and flowing composition rather than just a collection of rooms," the studio said. Between the living room and dining area, the team inserted a planter made of board-formed concrete, which establishes a spatial separation while "still allowing connection between the overlapping realms". In the master bedroom, a tongue-and-groove cedar ceiling merges with the exterior soffit. The interior design is fairly restrained, with rooms defined by concrete flooring and white walls. The team incorporated the occasional pop of colour or pattern, such as geometric tiles used for stair risers and the kitchen backsplash. "Composed of crisply detailed, considered materials, surfaces and finishes, the home is a balance of sophistication and restraint," the team said. 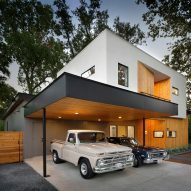 Matt Fajkus set up his eponymous architecture studio in 2010, and has since completed an asymmetric residence with a showroom for vintage cars and a low-lying concrete medical office in his native US state. Photography is by Brian Mihealsick, Bryant Hill, Twist Tours.